This article details the design process behind creating a swale as to meet our needs of a Permaculture Suburban Edible Landscaping project, Parkwalk Permaculture, in the temperate realm of the United States of America. Below is the diagram of the design process pattern use by TreeYo Permaculture and for an in-depth look at the design process itself click here and follow the links for a more detailed description of each. In the context of adding this element, a swale, within the whole design please enjoy the article below. 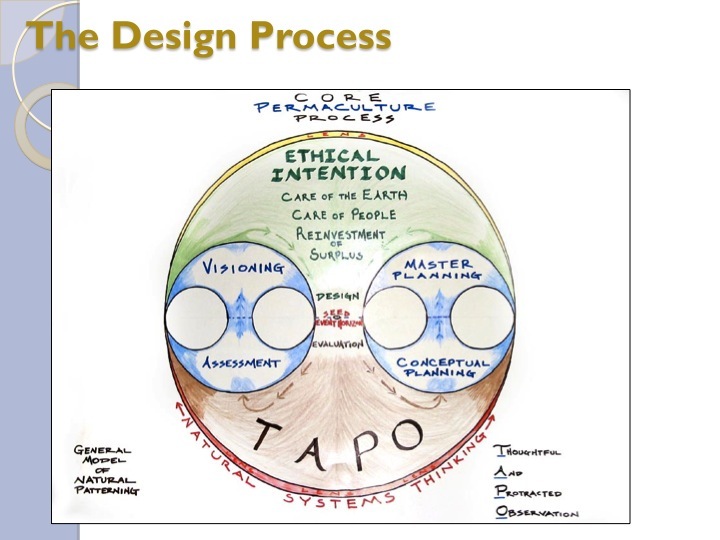 As the graphic says, you begin with a vision which is articulated in the slide below. It’s nothing grand but does focus how we approach this element and our subsequent steps ahead. From there we move into the assessment phase which requires a few steps. As the design process dictates, we are rooted in our observation that is protracted and thoughtful letting patterns of abundance arise. We are lead by our ethical intention which was met holistically in this project. So when is the best time to get out there and observe water patterns? Of course when it is raining! So over time I analyzed runoff on this small .22 acre (.09 ha) property observing waters concentration points and its relationship to landform. Pipes alight mostly in the backyard which correspond to varying roof pitches and an underground water drain. Having studied slopes and aspect in the field, fairly steep in places and south-south west-facing, I moved back to the office to check topographic maps provided by our county’s GIS system. It further confirmed the steepness of the slope and the direction the hillside was facing. From there a flow analysis was used to map the water flows based on in field observation and a design for constance known as “water moves at a right angle to contour.” Below you can see the topographic map inlayed on a semi transparent land use map. From this initial resource a base map was created and facilitated the flow analysis of water amongst other elements. and its so true). We have cold, dry air winters but with snowfall that can be significant. In 2014, we moved back to a zone 5 region after being designated zone 6 for quite some years. Annual rainfall for this part of Cincinnati, with lots of forest around from our 1500 acre (600 HA) city forest nearby is 41 in. or 1.092 m. This climate is classified as non-brittle as we normally get fairly even distribution of rainfall throughout the year. Summer thunderstorms usually bring summer precipitation although that general pattern is waning as climate’s variation seems to be teetering on the extreme button now. 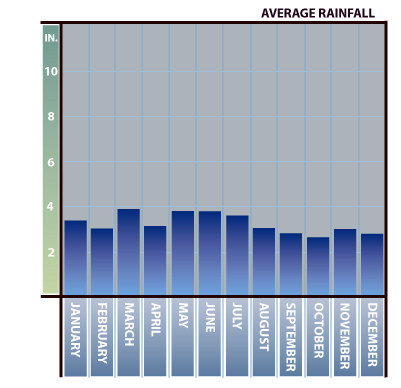 Thus we did catchment calculations for the full year and also for typical rainfall events. Below those figures are seen and to read more on how to do catchment calculations, please click here for that article. We read the contours of much of the backyard in the areas that observation and our analysis tools dictated where we might put the swale. We spaced the contour readings apart at about 2-3 feet (.6 -1m) and further analyzed the site with the students. This allowed us to get an in field accurate portrayal of the land. 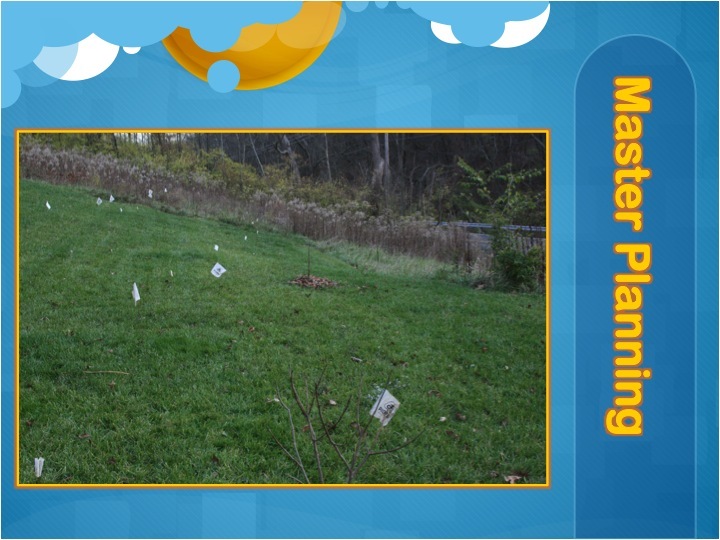 From there we moved into the master planning phase that utilized the contour lines we depicted with flags. We changed flag color to indicate exactly where we wanted the swale and again used leveling tools to get exact contour. We reviewed our vision and discussed sizing as we knew roughly the dimensions we were looking for and then went back to our assessment figures showing how you ping back and forth between design steps. Because we wanted to catch a near maximum rainfall event, we oversized the earthwork three-fold to hold a three-inch (7.5 cm rainfall event). With our contour line pegged for the swale we were then able to see how long the earthwork could be and get a fairly rough volume calculation. A swale is similar in shape to a triangle in size and when extrapolated over a third dimension, giving and an elongated pyramid, you can figure out volume capacity through simple geometric calculations. This allowed us to move into the design phase also beginning to better place plants and the spillway. The design then dictated to make the earthwork five feet wide ( 1.6 m) and 100 ft (30 m) long so that we could gain extra water holding capacity as water does also runoff from lawn surfaces and even a portion of the neighbours roof! Initial planning said only three feet wide (1m) but with these numbers and available hands to help, we went bigger. When laying out a swale you should have three rows of flags. One for the backcut which is where the earthwork begins and the ditch is first created. The next line is the point where the ditch stops and where the mound begins. The third line is where the mound ends and is usually proportional to the size of the ditch. I have found with sandier soils its better to downsize the mound slightly to get the raised bed effect. From there we moved into implementation, which was done with a good crowd of around 30 people. 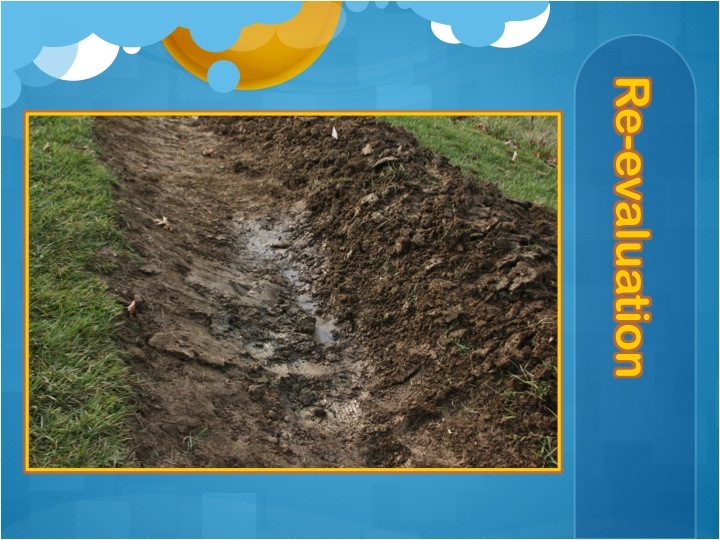 Picks and shovels are the most common used tools for hand dug swales. I like mattocks or pick axes for their heavy weight and cutting ability to shave off the top sod layer which is the first material placed downhill. This helps to ensure that rhizominous grasses will not sprout back but some is inevitable. Picks also help to break heavy soils while shovels move the dirt better in a nice form. One person can be working a pick going up and down the line once the sod layer is broken breaking up the soil while others shovel along. In the first day of the course we got nearly the whole earthwork done with just over an hour of concentrated digging and instruction. 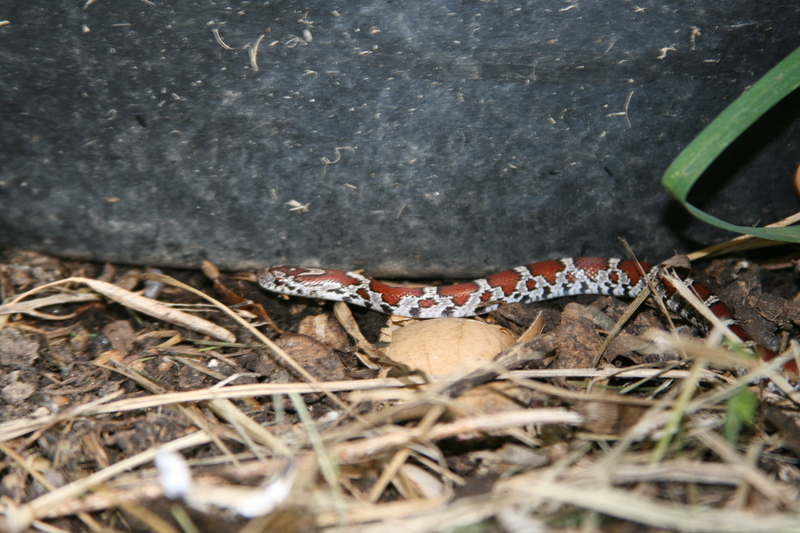 Overnight an anomaly happened that we were not quite expecting but were tipped off to when digging. We had hit a pocket of soil that the students called us over to and had the reminiscent odor and color of wetlands ( sulphur and grey mottled clay with black chunks of organic matter). The next day the bottom of the swale in that area had water already accumulated. We had hit a seepage spring! Upon further investigation, I had realized from old maps and reading the landscape that a creek had once flowed right through this spot but when the subdivision was built fill dirt had masked this previous landform. However underlying geology still forged a stream underground which was the reason for the home being fitted with the under ground, below house water drain. This of course changed our planting which is why the process of design should be approached from a pattern base not one of linear constrictions. We can follow a linear step by step process knowing that at any moment we can switch back to any of the original design process phases. The next day we further expanded the earthwork and implemented the spillway. Spillways are exit points for water to leave in excess rains. In the early years of the swale before it silted up a bit, I saw the spillway run only a couple of times. The spillway is a depression below the leveled mound so that this low spot facilitates water leaving in a desired location. Unlike this spillway, which you learn by doing and mentorship, should be broad and have gentle exit angles. Because ours was the opposite of that we reinforced it with several large stones creating stairs for crossing it which did greatly aid in the access part of the design. Remember to plan the exit route of the spillway accordingly to make sure it doesn’t become a nuisance for neighbors and hopefully directed into a next earthwork. From there other aspects of due diligence of creating disturbance ensued from the earthwork. On the uphill side of the mound on the back cut we sowed a diverse mix of legumes and annual grasses to act as a ground cover. We lightly mulched the seeds to protect them from the birds and drying affect after we raked them in. Also on the mound we added rotten logs from the adjacent forest in spots where we hoped to grow blueberries all the while adding fungal hotspots for mycelium to spread out. Moreover we sheet mulched the edge on the downhill side of the mound to prevent grasses from growing back. To kickstart the basic building blocks of the soil food web, bacteria, we dipped these lawn/ leaf bags in a molasses dilution to give easy foods for their populations to rebuild with. These bags also feed fungus and we greatly aided that by using the leaves that were held in the bags from fall leaf raking down in the suburbs. They are easily picked up curbside especially in the older 50’s neighbourhoods of the surrounding areas where Oak trees have now formed massive canopies from growing in the open. We chose to chop them up with a lawnmower to give them more edge and breakdown more rapidly and to prevent leaf blow in our dry windy winters. This reuse of waste carbon is a great example of energy cycling and helped us to build soil more quickly in these heavy fill dirt soils which were poor to say the least. This of course helps to support the associated plantings as all earthworks should have a focus on soil repair and perennial vegetation. We did plant a few things that winter but with the farmers almanac saying we had a harsh winter coming and it being November we decided to hold off until spring for the first phase of planting. The initial planting and those that have followed focused on creating guilds for the existing two paw paw trees which ended up at the toe of the mound, or where the mound hits the unaltered land. This was part of the design phase as these were the only existing features we really had to work around. From there we added other anchor plants like blackberry, chokeberry, blueberry, Goumi, Horseradish, and Jerusalem Artichoke. Other support species included comfrey, echinecea, goats rue, California false indigo, brown eyed susan’s, bee balm, cana lily astragalus. 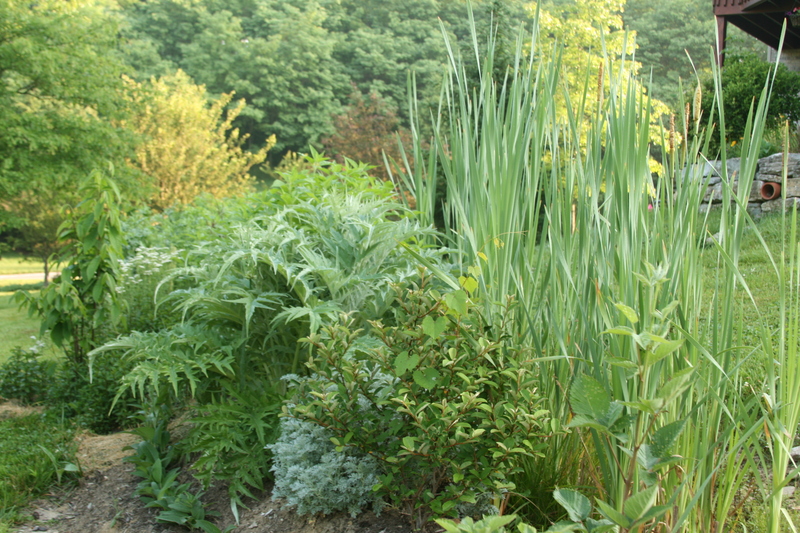 Later phases of implementation as the soils built and perennial vegetation filled out included more perennial vegetables like asparagus and French sorrel while that seepage spring supported blown in cattail and planted horsetail. More anchor plants and support species were included as the system evolved more including cornelian cherry, Russian hawthorn, serviceberry, Siberian pea shrub and supporters like cardoon, Egyptian walking onion, fennel, chives, wormwood, mint, oregano, yarrow, and lines of comfrey acting as terraces. Their big leaves shade exposed edges and help with the chop and drop maintenance of the site. We have also spent time weeding, mulching, watering when the droughts came, and planting annual vegetables. The space takes time to fill so we have planted tomatoes, peppers, and potatoes on the mound to fill gaps in the early years and as we rearrange things. Big harvests come each year from the Jerusalem artichoke with their starchy and very nutritious tubers. We pick herbs, pick berries, and hopefully paw paws this year (2014). We have also had to repair breaches on the swale on the steeper part where it erodes more quickly and some soil settled. So each spring we dig out the bottom on that side which seems to silt up most and replenish the mounds size. We do get torrential rains from time to time and the narrow spillway is definitely the weak point. Make them broader as it doesn’t really matter their length only how many inches or cm they are from the level of the mound. It’s the same water holding capacity if the spillway is 1 foot or 5 foot long. The broader spillway allows water to spill out in a more gentle flow rate thus ensuring no erosion or back up happens causing other low spots to breach. and even does its work in the winter with snow melt runoff. 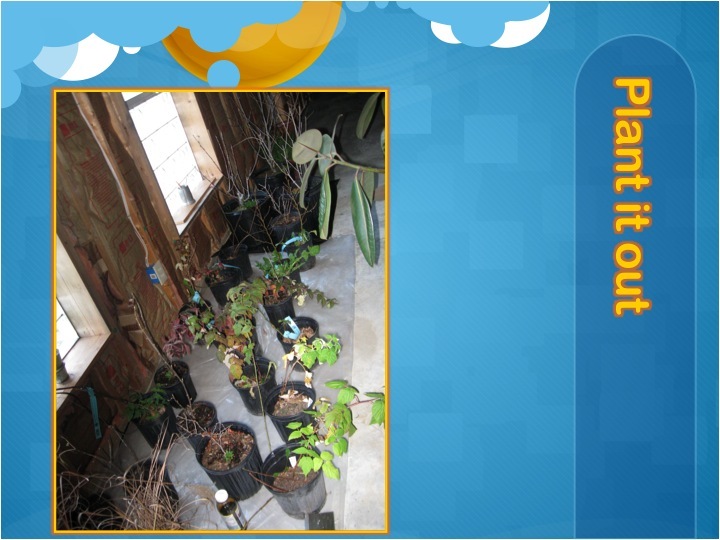 Some plants didn’t work at first and as I did my own plant propagation and networked with our local permaculture nursery, the design changed from its initial intent. Now that there is more shade, better soil fertility, and a more established level of succession, the new plants are thriving as well as the old anchor plants. Try your own and document and write about it as well please. Feel free to leave a comment about your experiences with swales below.